It might not provide the same technical challenge as skiing or snowboarding, but it's hard to argue that sledding isn't one of the best ways to take advantage of the winter. But what about those other snow-free seasons? Wouldn't it be fun to sled all year round? 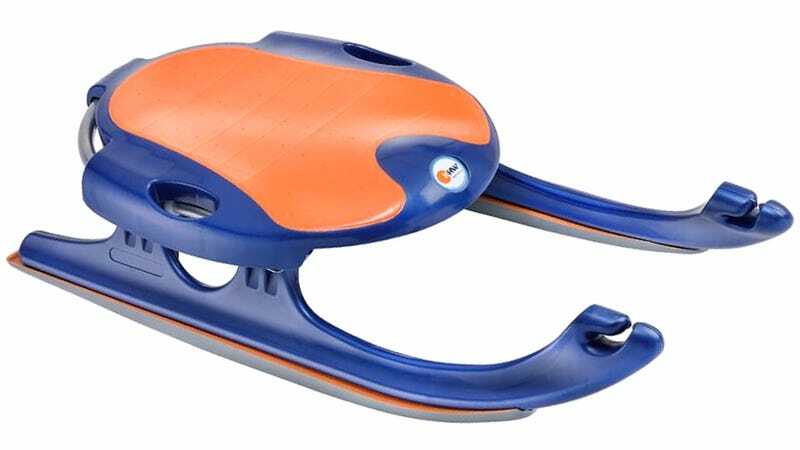 Of course it would, so Germany's KHW has developed the world's first plastic sled that works on sand instead of snow. It turns out that the plastic sled you use in the winter doesn't just automatically work on sand. Not only is there more friction on sand, but the gritty material also serves to wear away at plastic run after run. There's a reason we glue sand to paper for stripping away paint and smoothing out wood surfaces. So KHW enlisted the help of experts at the Fraunhofer Institute UMSICHT, and researchers at the Ilmenau University of Technology's polymers department, to develop a special plastic blend to be used for the sled's runners. Not only does it provide minimal friction when used on sand, it's also abrasion-resistant so riders never have to worry about waxing or the runners eventually being worn away. All they need to do is get it to the top of a mountain of sand and then hold on tight on the way down.